Automated identification of plastic compositions is desirable for a variety of applications, such as recycling, tracking the manufacturing source, antipiracy protection, and others. A variety of identification methods of plastic materials are known, including X-ray and infrared spectroscopy. The use of tags in plastic materials, e.g., UV and near-IR fluorescent dyes added to polymers for identification purposes. Fluorescence lifetime of an embedded dye can also be used for the identification purposes. In addition to the use of organic fluorophores, inorganic tracers were used such as yttrium vanadate, zinc sulfide (ZnS) associated to one metal, and organometallic materials. It is noted that the terms “first,” “second,” and the like, herein do not denote any amount, order, or importance, but rather are used to distinguish one element from another, and the terms “a” and “an” herein do not denote a limitation of quantity, but rather denote the presence of at least one of the referenced item. Additionally, all ranges disclosed herein are inclusive and combinable (e.g., the ranges of “up to 25 wt %, with 5 wt % to 20 wt % desired,” are inclusive of the endpoints and all intermediate values of the ranges of “5 wt % to 25 wt %,” etc.). The modifier “about” used in connection with a quantity is inclusive of the stated value and has the meaning dictated by the context (e.g., includes the degree of error associated with measurement of the particular quantity). The notation “±10%” means that the indicated measurement may be from an amount that is minus 10% to an amount that is plus 10% of the stated value. Compounds are described using standard nomenclature. 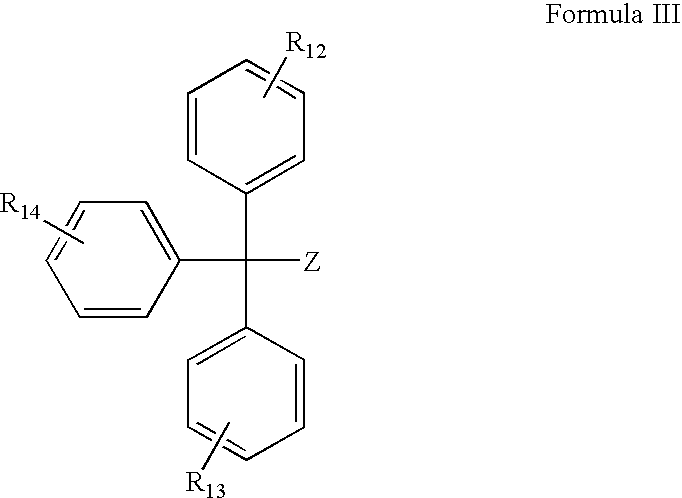 For example, any position not substituted by any indicated group is understood to have its valency filled by a bond as indicated, or a hydrogen atom. A dash (“—”) that is not between two letters or symbols is used to indicate a point of attachment for a substituent. For example, —CHO is attached through carbon of the carbonyl group. It is also noted that “medical” as used herein, includes dental, pharmaceutical, and the like. Example of color changing species includes organic color matter (e.g., organic molecules) that undergo a color change following an oxidation process. In one embodiment, the color changing species will be added to a resin during the formation of the article. Optionally, the color changing species can be materials having enough heat stability to be processed with the plastic material such that the plastic pellets used to form the medical article will have built-in color changing capability. The color changing specie can be present in a separate layer (e.g., film) that is applied to the device (e.g., by an IMD (in-mold decoration) process). In such case, the additive can be dispersed in the film material, and/or applied by a coating process, screen printing process, or the like, on top of the film. Such process may be useful when the color changing specie has a heat or processing stability that is not sufficient to be compatible with the extrusion/injection molding process used to produce the device. The color changing species can be in a non-ionic form, e.g., that can be transformed into an ionic form of a different color, e.g., upon exposure to a color change activator. The color changing specie can be in a form that is not oxygen sensitive. In a further embodiment, the color changing specie can be in a non-ionic form that is a blocked reduced form of a colorant. Essentially, the color changing specie can be in a stable form while being handled. The stable state can be a permanent state (e.g., no specific shelf life for the additive) or could be limited to a certain period of time (e.g. core-shell encapsulated activated additives). Organic color changing species can in a leuco form that has been made stable by blocking and/or encapsulation thus allowing the color changing specie to be handled in the presence of the color change activator during the manufacturing process. The blocking group can maintain the molecule in a blocked leuco form (i.e., in a state where the electronic conjugation in the chromophore is interrupted). After an activation/deblocking step, the leuco form becomes sensitive to the color change activator (the electronic conjugation is no longer interrupted) resulting in a visible color change after exposure to the color change activator. 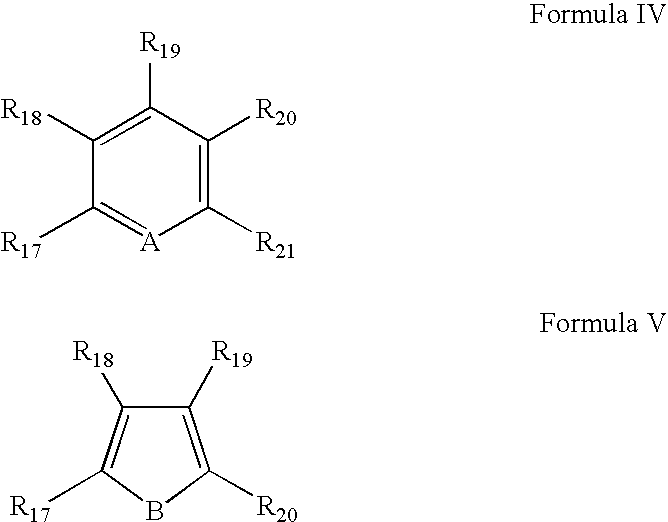 In Formula I, X in Formula I can be O or S. R1 to R8, individually, represent a halogen atom, a hydroxy group, an amino group, an alkyl group, an alkylamino group, a dialkylamino group, an alkyl ether group, a cycloalkyl group, a cyclic ether group, an aryl group, an aryl ether group, a heterocyclic group, a sulfonyl group, a carbonyl group, an ester group, a carbonate group, or the like. Adjacent substituents may also be part of a fused ring. R can be, for example, a substituent that forms a urethane, amide or a thioamide bond with the leuco dye, and can have sufficient heat stability to sustain the manufacturing process (e.g., an extrusion and molding process). Non-limiting examples of substituents include acyl groups ester groups and thioester groups (e.g., —CO— M, where M represents an organic substituent such as an alkyl, aryl, an alkoxy, an aryloxy, or a sulfonyl substituent), and so forth. In one embodiment, R is a benzoyl group. 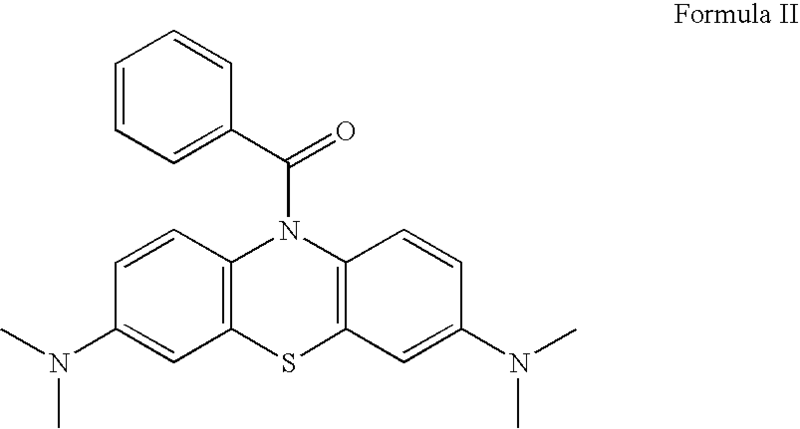 Formula II represents benzoyl leuco methylene blue (BLMB) a blocked leuco dye that is gamma radiation sensitive (i.e., deblocked) during gamma irradiation. In another embodiment, the R group on the leuco dye can be a peptide moiety or a peptide substructure such as —CO—CHR9—NR10R11, wherein R9, R10, and R11, can be a hydrogen atom, an organic substituent (linear or cyclic) that can, optionally, contain a heteroatom (e.g., Cl, Br, F, N, S, P, O, and so forth, as well as combinations comprising at least one of the foregoing) and can, optionally, be unsaturated; and so forth, as well as combinations comprising at least one of the foregoing. It is noted that peptide moieties typically contain proteases that cleave peptide or protein moieties into amino acids or their derivatives, and can, therefore, be the blocking group to detect the exposure to enzymatic cleaning solutions. In use, a packaged medical article comprising a color changing specie can be removed from the packaging. Once the article has been removed from the packaging, it is considered “used” since is may no longer be sterile, or otherwise usable, even if the article was only removed from the packaging without any further use thereof. The “used” article can then be reprocessed to clean and/or sterilized the article for subsequent use. If the article comprises a blocked color changing specie, the reprocessing can deblock the color changing specie such that, upon subsequent exposure to a color change activator, the color changes. Prior to UV exposure, samples using t-Boc as the blocking group for the LMB dye were stable (little or no shift in UV-vis spectrum) to heat (55° C.). There was some deblocking (formation of LMB λmax 360) when stored at 55° C. in the presence of camphor sulfonic acid. When exposed to UV, the t-Boc LMB samples showed deblocking (Abs360 increased) with exposure to UV (and not heat). This indicates that there was either more deblocking in samples with no camphor sulfonic acid or LMB was converted to methylene blue prior to inspection. There was also a higher Abs660 upon UV exposure. The greatest change in Abs660 (indicative of the formation of methylene blue) was seen in samples containing camphor sulfonic acid and with pre-heat (storing samples at 55° C.), which was consistent with the larger color change observed in the sample. Color data was reported in the CIELAB color space, using a 10 degree observer and a D65 illuminant light source. Chips were measured after molding and exposure to air at ambient temperature. (The chips were shielded from light by an aluminum pan while being exposed to air.) The color and spectral data were recorded as a function of air (i.e., O2) exposure time on an average of 5 chips. The results are presented in FIG. 4 and clearly show that the chips were darkening (decrease in lightness L* value) as a function of time, thereby confirming the visual observations (see pictures in FIG. 4). Because the decrease in L* value appears to be linearly dependent on the square root of the exposure time, the mechanism seems to be driven (i.e., limited) by the diffusion of oxygen in the polycarbonate chips. Hence, the kinetics of the process can be accelerated, decelerated, and/or delayed, for example, by using a resin matrix with different oxygen properties or by adding a reducing agent. After only 8 hours, the L* value (which was originally relatively high (L* greater than about 87)) dropped by about 3 units, which is a clearly visible change. After about 1 day, the L* value decreased by about 10 units. After two weeks of exposure, the part became extremely dark (L* of about 14), e.g., to the point that it was very difficult to perceive any visual color change. At that point, it was almost impossible to see through at the 3.2 mm thickness gage. The following temperature settings were used for the extruder (in ° C.): Feed/Z1/Z2/Z3/Die=250/260/270/270/270. Pellets, which were almost colorless, were packaged off the line into Foodsaver bags sealed under vacuum. The material was then molded into 5.08×7.62 cm chips (3.2 mm thickness) on a Boy 15S molding machine using the following temperature profile: Feed/Barrel/Nozzle (° C)=260° C./280° C./280° C. The chips appeared almost colorless after molding illustrating the better heat stability of the benzoyl blocking group as opposed to the t-Boc. The chips were packaged into individual sleeves and placed in a vacuum-sealed FoodSaver bag to protect them for light and/or oxygen exposure. Color and spectral data were collected on a MacBeth 7000A spectrophotometer in transmission mode. Color data are reported in the CIELAB color space, using a 10 degree observer and a D65 illuminant light source. Chips were measured after molding and then exposed to air at ambient temperature. The chips were shielded from light by an aluminum pan while being exposed to air. Some chips were stored. The changes light transmission in 3.2 mm chips were recorded as a function of air (i.e., O2) exposure time on an average of 5 chips. The results are presented in FIG. 7 for a loading of 0.1 phr of benzoyl LMB. Similar results were observed for the chips molded from a resin containing about 0.5 phr benzoyl LMB (see FIG. 8). A more significant spectral changed was observed with an increased loading of benzoyl LMB for a given air exposure time. Interestingly, a higher loading of benzoyl LMB did not seem to significantly affect the initial color since the molded chips still appeared colorless before being exposed to air. The spectral curves clearly show that the chips were changing color as time evolved (which is consistent with visual observations: the chip went from colorless to dark blue-green over time) from the oxygen exposure. From the curve, it can be seen that there is no methylene blue (MB) initially present in the chip (no specific absorption at about 650 nm). Also, the relatively flat curve seems to indicate that there was little, if any, MB formed during the extrusion that degraded during molding. It is noted that the oxygen sensitivity observed for the benzoyl LMB was a rather surprising result since benzoyl is one of the most stable blocking group. Not to be limited by theory, because of the theoretical stability of the benzoyl, one could have expected no color change at all after extrusion/molding in response to oxygen only (i.e., blocked leuco form totally intact). Note that the color shifts observed correspond essentially to a negative shift in the b* value, which is consistent with the fact that the parts visually turn to a blue color. When looking at the changes in the spectral curve as a function of time, it appears that this shift in the b* value is essentially caused by the increase in absorption at about 650 nm which corresponds to the formation of methylene blue in the material. It must be noted that such color shifts greater than 10 units, and especially greater than 20 units can be immediately picked up by an untrained eye. It must be emphasized that the color differences observed for parts that have been exposed to gamma radiation are significantly larger (6 to 7 times larger) than those observed by only exposing the molded parts to oxygen in the absence light. This examples illustrates the fact that it is possible to create resins containing blocked leuco dyes that will get deblocked during gamma radiation sterilization and could be used as a built-in open package/usage indicator for medical devices when combined with a oxygen barrier (and/or oxygen scavenging) packaging material. 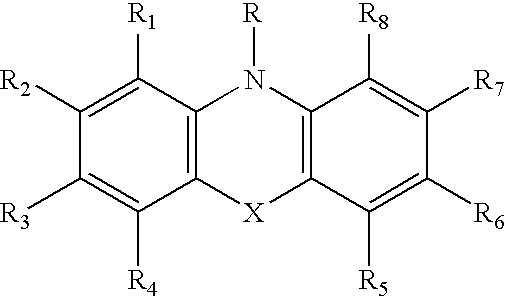 Some of the blocked leuco dyes described above that produce a blue/violet color in their oxidized form and can be incorporated into a polycarbonate resin, such as the benzoyl-leuco methylene blue, loose their blocking group during gamma radiation sterilization and become highly oxygen sensitive. If exposed to oxygen during and/or after sterilization, the oxidized (i.e., blue/violet color) form of the dye is obtained. This technology can be employed in pharmaceutical applications (e.g., medicine containers such as bottles, bubble wrap packages, and the like), medical articles (e.g., instruments (e.g., trocar, syringe, scalpel, tubing (e.g., suction tubing, intravenous tubing, and the like), packaging around sterile items (such as bandages, gauze, instruments (scalpel, mirror, pick, drill, and the like), and the like, as well as many other applications. Based upon the location of the color changing specie, and the state of the color changing specie (blocked or active), different activities can be identified. a protective layer capable of inhibiting exposure of the medical article to the color change activator prior to use of the medical article. 2. The medical article of claim 1, wherein the color changing specie comprises a leuco coloring matter selected from the group consisting of leuco azine coloring matter, leuco aryl methane coloring matter, leuco indigo coloring matter, and derivatives and combinations comprising at least one of the foregoing leuco coloring matter. 3. The medical article of claim 1, further comprising a kinetics controller in communication with the color changing specie. 4. The medical article of claim 1, wherein the color change additive is in a coating on the plastic portion. 5. The medical article of claim 4, wherein the coating is on an inner surface of the medical article. 6. The medical article of claim 1, wherein the color change additive is disposed in the plastic portion. 7. The medical article of claim 1, wherein the color change additive is disposed in the plastic portion. 8. The medical article of claim 1, wherein the plastic portion is opaque. 9. The medical article of claim 1, wherein the protective layer comprises removable packaging. 10. The medical article of claim 9, wherein the protective layer has an oxygen permeability of less than or equal to about 1.1 Barrers, and further comprises an oxygen scavengers. 11. The medical article of claim 1, wherein a period of time of 12 hours after an initial exposure of the color changing specie to the color activator has a CEILAB ΔE* of less than or equal to 4 units. 12. The medical article of claim 11, wherein the period of time is 24 hours. 13. The medical article of claim 1, wherein the color changing specie is capable of a sufficient change in color to obscure a marking on the medical article. 14. The medical article of claim 1, wherein the medical article is selected from the group consisting of medicine containers, medical instruments, and medical packaging around a sterile item. 15. The medical article of claim 14, wherein the medical container is selected from the group consisting of bottles and bubble wrap packages. 16. The medical article of claim 14, wherein the sterile item is selected from the group consisting of bandage, gauze, syringe, and instrument. 17. The medical article of claim 1, wherein the color changing specie is encapsulated. 18. The medical article of claim 1, where an color changing specie further comprises a blocking group selected from the group consisting of carbamate, thiocarbamate, enamine, imine, acetal, sulfenyl, sulfonyl, phosphoryl, alkyl, imide, amide, benzylic moiety, and combinations comprising at least one of the foregoing blocking groups. 19. The medical article of claim 1, wherein the color change activator is selected from the group consisting of light, oxygen, rinsing/cleaning solutions hydrogen peroxide, ethylene oxide, body fluids, and combinations comprising at least one of the foregoing. 20. The medical article of claim 1, wherein the color change activator comprises oxygen. 21. The medical article of claim 1, wherein the color changing species comprises an organic color matter. 23. The medical article of claim 22, wherein the post-processing is selected from the group consisting of ethylene oxide sterilization, enzymatic cleaning, gamma radiation, disinfecting solution, and combinations comprising at least one of the foregoing re-sterilizations. 27. The medical article of claim 26, wherein the blocked color changing specie comprises a blocking group selected from the group consisting of —CO-phenyl, —SO2—C6H5, —CO—C—(CH3)3, —CO2C2H5, —CO-phenyl-NH2, —CO-phenyl-alkyl, —CO-phenyl-alkoxy, —CO-phenyl-halogen, —SO2C4H9, -tosyl, and combinations comprising at least one of the foregoing blocking groups. 28. The medical article of claim 22, wherein the re-sterilization is selected from the group consisting of heat, cleaning solution, steam, and combinations comprising at least one of the foregoing re-sterilizations. 29. The medical article of claim 22, wherein the blocked color changing specie is photosensitive, and further comprising a light blocking packaging, wherein the light blocking packaging is capable of preventing exposure of the blocked color changing specie to light. 30. The medical article of claim 22, wherein the color change does not affect functionality of the medical article. 31. The medical article of claim 22, wherein the blocked color changing specie further comprises a blocking group selected from the group consisting of a carbamate, thiocarbamate, enamine, imine, acetal, sulfenyl, sulfonyl, phosphoryl, alkyl, imide, amide, benzylic moiety, peptide moiety, protein moiety, and combinations comprising at least one of the foregoing blocking groups. sterilizing the packaged medical article to form a sterile medical article. 33. The method of claim 32, wherein the processing activates the blocked color changing specie. 34. The method of claim 32, wherein the blocked color change specie remains blocked after the manufacturing processing, and wherein the blocked color changing specie is capable of being activated in a post processing that is different from the manufacturing processing. 35. The method of claim 33, wherein the post processing is selected from the group consisting of ethylene oxide sterilization, enzymatic cleaning, gamma radiation, disinfecting solution, and combinations comprising at least one of the foregoing post-processing. 36. The method of claim 32, wherein the post processing is selected from the group consisting of heat, cleaning solution, steam, and combinations comprising at least one of the foregoing post-processing. 37. The method of claim 32, wherein the blocked color changing specie is photosensitive, and wherein packaging the medical article comprises disposing a light blocking material around the medical article. 38. The method of claim 32, wherein the packaged medical article further comprises a packaging material that inhibits exposure of the sterile medical article to a color change activator such that a CIELAB ΔE* of greater than or equal to about 5 can occur after the sterile medical article is removed from the packaging and exposed to the color change activator. 39. The method of claim 32, wherein the packaging material comprises an oxygen permeability of less than or equal to about 1.1 Barrers. 40. The method of claim 32, wherein the blocked color changing specie is packaged prior to deblocking. wherein the color changing specie has a CIELAB ΔE* from the first time to the second time of greater than or equal to about 10. 42. The method of claim 41, wherein cleaning and sterilizing the used medical article further comprises deblocking the color changing specie. deblocking the color changing species in the used medical article. 44. The method of claim 43, wherein deblocking the color changing specie further comprises post processing, wherein the post processing is selected from the group consisting of ethylene oxide sterilization, enzymatic cleaning, gamma radiation, disinfecting solution, and combinations comprising at least one of the foregoing post-processing. 45. The method of claim 43, wherein activating the blocked color changing specie further comprises post processing, wherein the post processing is selected from the group consisting of heat, cleaning solution, steam, and combinations comprising at least one of the foregoing post-processing. ES2277354T3 (en) 2007-07-01 Composition having improved fluorescent response.